also I don't really care about brake dust, I guess in order of importance for me is stopping power, pad life, and no squeel. I don't mind if there is less braking power when they are cold but, I don't want to have to stand on the brakes either. The green stuff ones provide great stopping improvement. Mine only last a bit over 20k miles but the performance improvement was worth it. I've not tried the yellow? which is the next level pad. Supposed to be a good street pad that lasts a bit longer. I've also used Porterfield R4S pads and they were great as well. You really can't go wrong with any of the major brand performance pads out there. 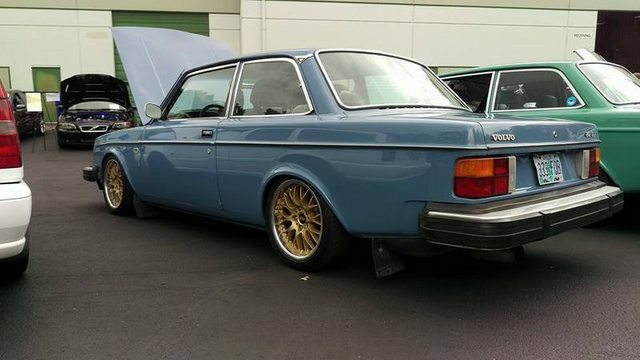 That is if they make something for a Volvo 240. They actually do according to their website always wanted to try them. If you're not particular to EBC, the Hawk HPS are wonderful pads. EBC Yellow are excellent. Even the Red series are a very good daily pad. I say go for it! You cannot have too much of a good thing in brakes. As the old saying goes: If speed kills, do brakes give life? Any issues mixing pad types front to rear? I think the Hawk HP plus is only available for the front on 240's. Be nice to have more "bite." Does anybody know the part number for front pads EBC red? For a 240 series its DP3143C. My opinion on them is.. the cold bite is a bit weak,but after a while(warm up) they work good. It was a very long time ago, but wouldn't touch EBC pads, period. There are some solid US based alternatives listed above, but I'll probably go full-race Ferodo next time I need something serious (because I'm not US based). I've had good experience with ebc red stuff pads on the 242 and my Toyota. I just bought some pagid pads from FCP for $20 to try out. Very good comparison of the Hawk line up and mimics my impressions of the HPS pads on a daily. Which is equal to: I will never run HPS pads on a daily again as they are loud and dusty. HPS are too aggressive for the street. IMO the Yellows are a great performance daily IF IF you have great tires, otherwise they are overkill. Really you need dedicated summer tires to justify Yellows. Reds are a good realistic daily with very good AS tires. Any of these matched with the Bosch QuietCast rotors have been a nice setup. I put EBC reds on my wife's Outback and they work well for a daily. They don't dust very bad. And there was no discernible for me difference between cold and warm. I have reds in the TSX wagon. They are fine. Somewhat dusty. They fade on a normal drive down a steep hill over 2 miles at around 20-25 mph, but that may be an issue with undersized rotors on a car that large. I just put a set of Green Stuff pads in my '67 1800s, which replace a set of Volvo OEM semi-metalic pads. I followed the 200-mile break-in procedure and now am enjoying 10-15% better braking. I would recommend them to anyone that is interested in trying them. I am a fan of Hawk HPS myself. Still have yet to drive/ride in a car with EBC pads. Been running the green's on my wagon with the Wilwood setup up front. Performance-wise they are great, but damn they are dusty. Normal driving, you'll start seeing dust after maybe 30 stops. After a week of normal commuting the wheels will be pretty covered with dust. After a month they will be black. This. Marketed as a race pad, but various road pads are better performers. Run of the mill ceramic pads do a decent job up to reasonably high temperatures, and don't do anything silly. If you're a traffic light racer, could be worth a look. I put EBC yellow on my Fiesta ST for this summer and after one track weekend (https://youtu.be/BDfaR5M6P78?t=2m) I'm happy enough. The car is extra hard on brakes thanks to goofy ABS-based fake diff. If they faded, I couldn't tell through the boiling fluid as they always seemed to dig at the bottom, though I used what looks like about a third of them or more in front. They bite a little better with some heat, but they're fine cold to me. Notably quieter than my stock pads, especially after seeing high temps. Dust, couldn't say, I bought matte black wheels for a reason. Last edited by rwb; 06-04-2018 at 03:32 PM.. I should add, I bought the yellows over Hawk et al. because I watched an Acura TLX, which has 100hp and 1000lbs on me, do hard work on Summit Point's Shenandoah circuit, which is very hard on brakes, using these. Did you bed your reds hard and proper? They're supposed to be the most aggressive compound so I'm surprised you had them fade unless the rotors were shiny. I did also notice some anecdotal but still serious-looking QC issues from EBC 3-4 years ago, but since I hadn't seen any recent complaints, and their performance had been proven to me in person, I bought in. I believe if there were a serious issue with my pads, I would have seen it by now. Last edited by rwb; 06-05-2018 at 11:14 PM.. I thought the reds were ceramic based more for daily driving and occasional sport user and the yellows were for more high temp operation? Whoops, looks like you're right. I thought it went green, yellow, red, but I guess it's green, red, yellow, blue/orange, and the first two are not supposed to be trackable. I do see they still recommend a series of 60-to-10 threshold brake applications to bed in even the non-track pads for "street/urban driving," which is kinda ****ed up. I'd hope they don't glaze over if one doesn't have a great place to do that in their street car. Always used Volvo OE pads and never been disappointed. Stop much better then the aftermarket stuff although they produce a fair amount of dust.